“A large slice of America’s not-well-known past and of an eccentric genius who helped develop modern aircraft. A well-researched, honest evaluation of a man and his times.” —Kirkus. This is a spellbinding book about a man who was many things to himself and others. 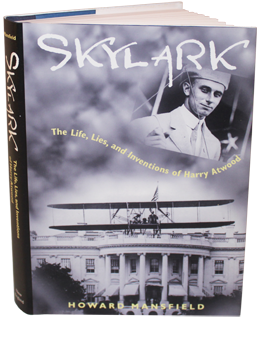 Pioneering aviator Harry Atwood makes a strange and at times maddening subject, but thanks to Howard Mansfields intriguing biography its hard to stop reading about him . . . [Atwood] was a daring pilot who pushed his primitive aircraft to early distance records, and he deserves recognition as a visionary who predicted the future of aviation and space exploration with uncanny clarity. —Leonard E. Opdyke, Publisher, World War I Aero and Skyways. "What was it like to fly in 1911? We want to be told it was like the birds—the man-birds as they said—like the eagle and the skylark. We want to hear talk of air ruffling feathers, of floating along dreamily among the clouds. We want poetry. But flying was something altogether different. It was struts and wires, engines and oil, wind in the face, and crowds that rushed an aeroplane eager to sign their names on it or tear it apart."